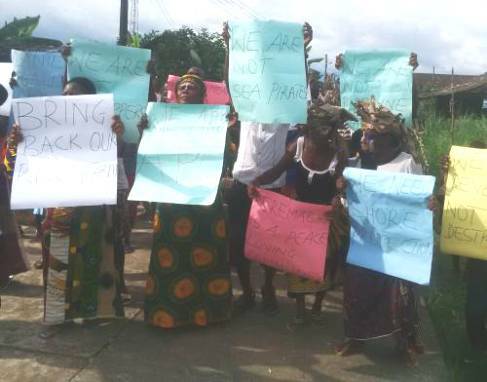 LAGOS SEPTEMBER 26TH (URHOBOTODAY)-Scores of women from Iwhre-Nene community in Ughelli North Local Government Area of Delta State yesterday blocked a side of the Ughelli axis of the East-West Road in protest over the alleged intimidation and arrest of indigenes of the community by soldiers on a manhunt for members of the Urhobo/Isoko militant group, Niger Delta Greenland Justice Mandate. Operatives of 122 Battalion, Nigerian Army, Agbarha-Otor in Ughelli have been combing some communities in Ughelli axis since last Monday when the militant group claimed it breached the Afiesere-Ekiugbo delivery trunkline operated by NPDC/Shoreline under its Operation Crocodile Tears. Security sources alleged that soldiers have succeeded in effecting some arrests that could lead to the apprehension of the masterminds of the series of attacks on oil pipelines in the area. But as the security agents intensified efforts to pick up the perpetrators of the act yesterday, several women trooped onto the East-West road leading to Bayelsa and Rivers States in protest against what was described as intimidation and indiscriminate arrests of the men by the soldiers. As early as 8 a.m, they stormed the road and distrupted vehicular movement for about an hour thereby causing traffic gridlock for road users heading towards Bayelsa and Rivers States from Warri. The women leader of the community, Mrs. Agnes Isheme, who spoke onbehalf of other protesting women said they were on the road to protest alleged intimidation of their husbands and sons by soldiers. “We are protesting because of the continuous intimidation of our husbands and sons by soldiers. Our men no longer stay with their families because of fear of arrest by security agents under the allegation that they are oil pipeline vandals. “The people of Inene are peasant farmers who have nothing to do with pipeline vandalisation, this pipeline cuts across Ekiugbo, Inene and Afiesere communities, why is it that whenever there is anything that happens on the pipeline, their (soldiers) point of call is Inene community?” She queried. President General of the community, Mr. Samuel Onosakpor, while decrying the continuous intimidation on indigenes of the community by the soldiers said they were innocent of the pipeline vandalism allegation being leveled on their community. “For the records, we don’t harbor criminals, or militants in our community and we have no reason to go and vandalize pipelines. “I am using this opportunity to appeal to the Nigerian army to always confirm and verify their information before they invade our community under the guise of arresting vandals as we would not hesitate to take legal action against anybody that wants to tarnish the image of our community,” he said.